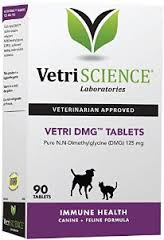 Vetri-DMG is administered on a daily basis (twice a day for the first two weeks). DMG is a water soluble nutrient produced naturally in both humans and animals that helps the body use nutrients efficiently at the cellular level. DMG has been proven in clinical studies to increase antibodies which helps keeps your pet free from viral and bacterial infections. As a bonus, it also helps support stamina and circulation, so your pet can be happy, healthy, and active.